Many will focus on Washington’s impressive offense in their big win against Stanford. But it was the Washington Huskies pass rush that helped shut down McCaffrey and the Cardinal offense. Ryan Dukarm looks at how they did it. The Washington Huskies asserted themselves as a 2016 playoff contender with a crushing 44-6 victory over the Stanford Cardinal. While the offense performed well, logging 424 yards of total offense and running for 5.2 yards per carry, it was the defense that stole the show, allowing just 213 yards of offense, a meager 1 yard per carry, and racking up eight sacks of the Stanford quarterbacks. The Huskies ability to get after the QB throughout the game was a major factor in the win over their Pac-12 rival. With a combination of scheme, individual talent, and cooperative pass rushing, the Huskies registered eight sacks and a trademark win over a Pac-12 powerhouse. To beat the Stanford offensive line, the Huskies defense used a number of creative schemes and twists to place rushers in advantageous matchups and one-on-one rushing situations, often times without having to rely on rushing more than four defenders. They sent more than four defenders only once on their eight sacks, allowing more players to drop into coverage and stymie Stanford’s passing game. For the Huskies second sack of the day they utilize a tackle-end exchange stunt. On this play, Stanford has 20 personnel on the field, lined up with a running back and fullback in the backfield, an inverted slot look to the right, and a wide receiver split out to the left. Washington is in dime personnel, with two defensive linemen, three linebackers, and six defensive backs. 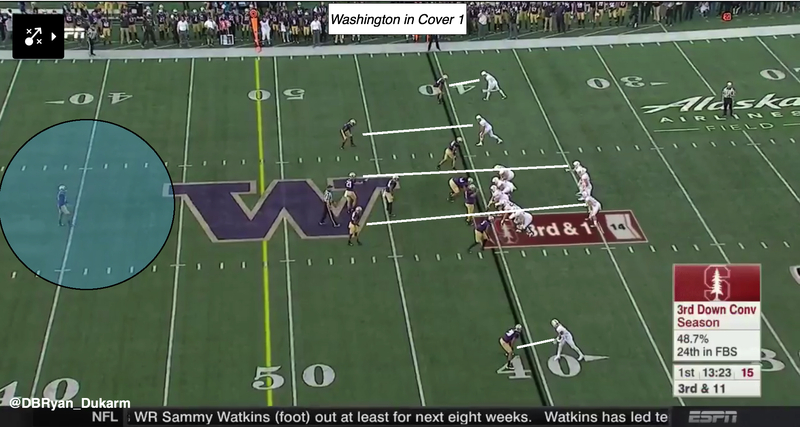 Washington shows Cover 1 presnap, which means defensive backs Budda Barker (#32) and Taylor Rapp (#21) are in man coverage against running backs Christian McCaffrey (#5) and Chris Harrell (#82), respectively. Once the Cardinal offense begins the play, both McCaffrey and Harrell stay in to block, which causes their respective defenders to rush forward to blitz or defend a shorter route. As defensive tackle Vita Vea (#50) moves to the outside of the line, drawing both the right guard and right tackle, Harrell steps up to fill the void. However, with Rapp running down to rush after Harrell stayed in the backfield, Harrell steps up to block the “blitzing” defensive back. This leaves an open lane for outside linebacker Psalm Wooching (#28) to loop back around the two offensive linemen, and explode into the pocket for a sack. 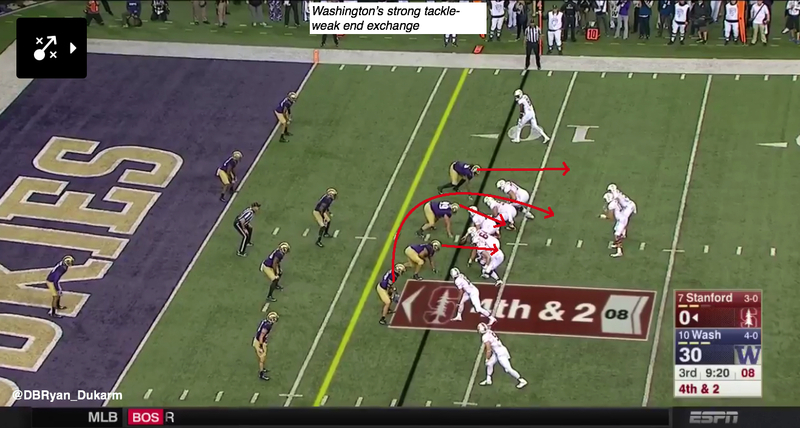 This play worked because of the great scheme design the Huskies deployed. The tackle-end exchange also paid dividends later. The Huskies would again run a stunt along the defensive line to get a sack in the third quarter, this time utilizing a strong tackle-weak-end exchange. This stunt has the same basic principle as the tackle-end exchange, but the defensive end instead loops behind two crashing interior defensive lineman rather than just one. This time Stanford has 10 personnel on the field, with McCaffrey to the right of quarterback Ryan Burns (#17) and trips to the left. Washington is in a nickel defensive package, with three defensive linemen, three linebackers, and five defensive backs. Wooching is lined up over the slot receiver, and does not appear to be poised to rush the passer, while in reality he will be the looping end in the strong tackle-weak-end exchange. At the snap, defensive tackles Elijah Qualls (#11) and Greg Gaines (#99) both burst off the ball and crash to their right, occupying all the offensive linemen from the right guard to the left tackle. Wooching begins by heading upfield toward the left tackle, before looping behind the mass of bodies in front of him and going through the open B gap to sack Burns on fourth down. While two of Washington’s sacks were results of great scheming, others were simply great individual efforts along Washington’s defensive front. One such example is below, where both Washington outside linebackers use great pass rushing technique to win their individual matchups and pressure/sack the quarterback. Stanford has 11 personnel on the field, with a slot formation to the left, a pro set to the right, and Gun Right in the backfield. Outside linebacker Joe Mathis (#5) is lined up as the defensive left 9 technique, just outside the tight end. Opposite him, Wooching is the defensive right 7 technique, lined up just outside the left tackle. Mathis attacks the right tackle with a speed rush, bursting off the line and bending around the edge, staying low and balanced through contact with the right tackle. McCaffrey comes over to assist the offensive tackle, but is unable to do so as he gets too wide to do much and Mathis is able to split the difference between the tackle and McCaffrey and pressure the quarterback. On the other side of the field, Wooching executes an excellent push-pull pass rush maneuver, as he bursts forward off the line, establishes his hands to the breastplate of the offensive tackle and pulls the tackle towards himself, quickly and powerfully shedding the offensive tackle to sack Burns. 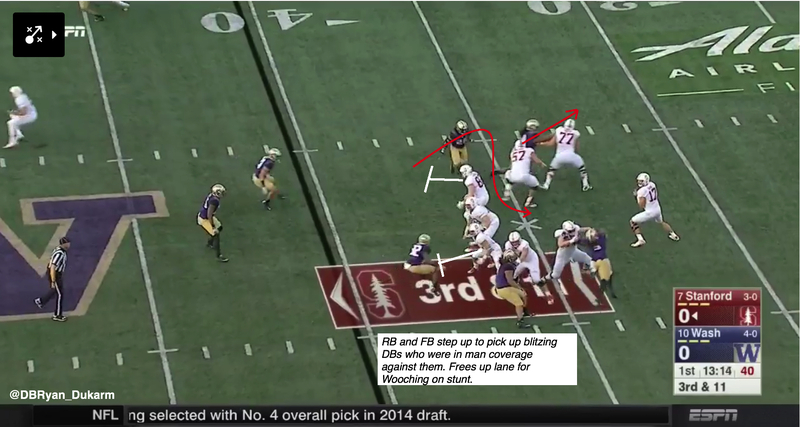 The final way in which Washington beat Stanford to pressure the QB was with great cooperative pass rushing. Rushers occupy extra blockers to free up open lanes for their teammates, fully willing to sacrifice their own stat padding in favor of a great team play. With just 35 seconds left in the first half, the Cardinal offense is facing 3rd and 13, and are right on the edge of field goal range while trailing 23-0. They are in 10 personnel, with a Gun Right Trips Left formation. 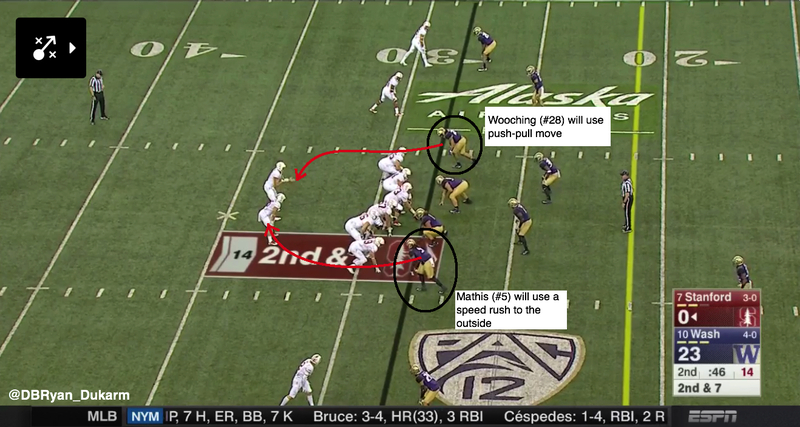 Washington is in their 4-2-5 nickel defense, showing a four man rush from an over front. At the snap, the right defensive end (top of the screen) rushes to the outside and takes the left tackle out of the play. Defensive right 3 technique Elijah Qualls (#11) takes two steps at the right guard before executing a spin move to the inside, demanding center Jesse Burkett (#73) slide to his left to assist the guard in blocking him. Mathis, the outside linebacker at the bottom of the screen, comes off the line vertically, pressing the right tackle to the edge before beating him inside with a spin move, which demands that McCaffrey assist the struggling tackle within moments of the ball being snapped. All of these players occupy the offensive line along the periphery of the play, which gives 1 technique Greg Gaines (#99) a one-on-one matchup with right guard Johnny Caspers (#57). Gaines is faster off the ball, immediately executing a rip move to Caspers’ left and getting through him to apply pressure to the QB. Gaines is able to win this one-on-one matchup because his teammates did an excellent job of occupying the rest of the Stanford pass protectors, with two teammates demanding double teams to keep them out of the backfield. Gaines dominates Caspers on this snap and is able to get in the backfield and immediately sack Burns to force a punt and prevent a field goal attempt. Washington dominated Stanford throughout the night, and much of that is because of the way their defenders were able to control the Stanford offensive line. 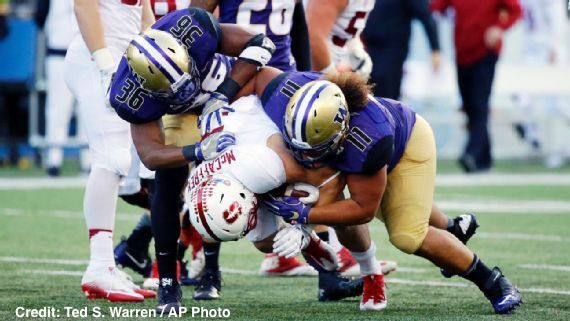 With their combination of scheme, individual talent, and team-first pass rushing, the Washington Huskies should be a consistent leader in sacks and pressures in the Pac-12 and all of college football in 2016.